for youth from foster care. Foster Progress empowers Illinois youth currently or formerly in foster care to attain a college degree and transition into adulthood successfully by providing mentorship, advocacy, and educational opportunity. Imagine what an impact we could have if we gave youth the very best instead of the bare minimum. We start with the assumption that youth in foster care are capable of reaching their dreams if they have high-quality supports. We inspire them with a long-term vision of their future and help them put the pieces in place to make it into a reality. We provide college educated, highly trained, one-on-one mentors to youth in foster care desiring to attend college. We connect students to scholarships and grant money already available to them, as well as giving youth the opportunity to earn up to $5000 in Foster Progress’s Mentoring and Scholarship program. We partner with the family, the high school, the foster care agency, and the college to provide a web of support for young people. We advocate at colleges and at the state level by sharing resources and promoting better practices and policies proven to encourage youth's success. "I believe college changes lives. If I can help one young person to earn a college degree, I have deeply impacted not only that individual, but also their family for generations to come. And that impact will reverberate through the entire foster care system." The foster care system is designed to keep children safe – to find them a bed, to make sure their most basic needs are being met. But for youth who “age out” of foster care, outcomes are bleak. Foster Progress was founded on the principle that kids need more than the basics. They need hope and a vision for the future. In Illinois, we compared the number of youth who filled out the FAFSA (the first step in applying for financial aid) to those who actually enroll in college and those who will likely end up graduating. 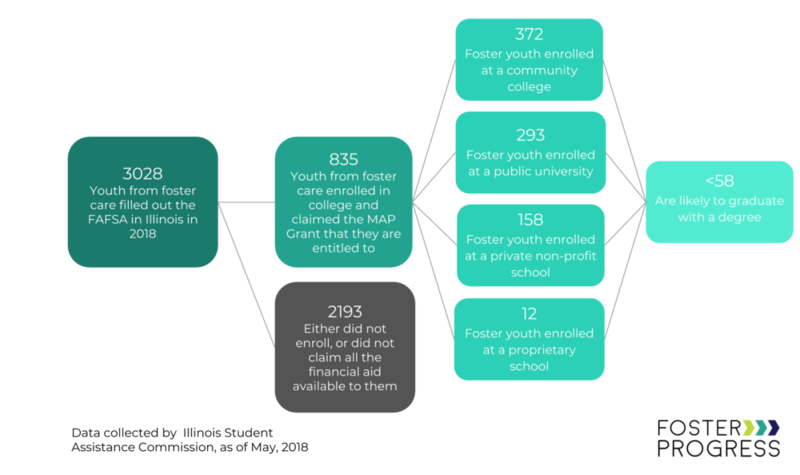 These numbers make a clear case for programming like ours that prepare and support foster youth in their pursuit of higher education. Without the safety net most of us depend on, these obstacles seem insurmountable. But with the right supports, they are problems we can solve. Foster Progress Mentors come alongside these youth in high school, before they age out, to plan and problem solve, to encourage and support their dream of college, graduation, a career, and successful adulthood.